Published May 28, 2011 By Anna T. This post may contain affiliate links. Regardless, I only recommend sites I've researched and/or used and trust. Scribie is a transcription company that actually used to be known as CallGraph, and they allow people to work from home. They recently moved to another domain and gave themselves the new name. My sister sent me the link to this site a few days ago because someone had emailed her referring her to it, but she wasn't interested in transcription work and thought I might be. I'm actually not too keen on transcription myself, but I know that many of you are, so I thought this would be a good opportunity to review here. Scribie hires freelance transcribers with different levels of experience, meaning that you have a good chance of getting on with them whether you're just beginning in the transcribing field or already have years of experience. There are no minimum hours that you must work, which makes it incredibly flexible. You can just log on at any time and grab what work you want (assuming there is any). Every file you do goes through a three-step process: raw transcription, review, and verification, and you are paid per audio hour for what you transcribe. The stuff you'll be listening to is telephone calls, interviews, speeches, etc, and no file is longer than 6 minutes. Another neat feature with Scribie is that you can listen to a little bit of an audio file before you select it, so if it's something that's really garbled and hard to make out, you can just drop it and pick something else instead of being stuck with it. How much does Scribie pay? You get paid $5 for every 3 audio hours. It used to be $10 per audio hour. Yes, this is extremely low and not what professional transcribers earn. So please, if you do this, just look at it as extra cash. A file that was 6 minutes long would pay $1. Payments are made via Paypal (it's the only method of payment available with Scribie), and your money will go into your Scribie account as soon as your transcribed work has been approved. You only need $1 to request cashout, and you will normally get your money within 24 hours after requesting it. I think this is great! It makes Scribie just one more place to add to the list of companies offering daily payout. Before you sign up, make sure your Paypal account is verified. Otherwise your app won't go through and you'll have to start all over. Scribie hires you as an Independent Contractor, so no taxes are taken out of your pay. You'll have to report your earnings when you file your taxes if you make $600 or more in a given year. Being an IC also generally means no benefits, unfortunately, but most people view Scribie as an “extra money” gig and not necessarily something to do full-time anyway. What does the application process for Scribie involve? You can apply to be a freelance transcriber on their website. As stated above, you don't necessarily have to have experience — they may hire you even if you're just a beginner. If they select your application for consideration, you'll be put on a waiting list to take a transcription test. Once the test is reviewed, you'll be notified as to whether or not your work was up to their standards. If it was, you're basically hired and you'll get paid for your test file. If your test did not meet their standards, you'll receive it back with notes showing what you did wrong, and you can retest. Scribie will let you retest up to 10 times, so don't get too discouraged if you fail the first few times — you'll get lots more chances! As far as necessary equipment goes, an up-to-date computer with high speed internet is necessary, and it's also important that you have a decent headset to use. The only approved web browsers for working in Scribie are Firefox, Chrome, and Safari. You can. If you are consistently submitting good quality or excellent quality work, you might get promoted to “reviewer” status. This means that you can review the stuff you transcribe as well as files transcribed by others. Does Scribie have a referral program? Yes, but you can only take advantage of it if you are a reviewer. As a reviewer, you can refer people you know to Scribie and earn a five percent commission off their earnings once they've been hired. Does Scribie hire people outside the United States? They do, but if you can't get a Paypal account where you live, you can't get hired because Paypal is the only method of payment Scribie offers. You also probably won't get hired if your English isn't fluent. What do others say about Scribie? I've checked into it, and the Glassdoor reviews are mostly not great. While the workers do like the flexibility and the fact they can get paid daily, most agree that the very low pay just isn't worth it. One reviewer said they pretty much had to do 50 transcripts per day just to make $25. Feel free to check out the Glassdoor reviews yourself and draw your own conclusions. How do you apply at Scribie? If you want to apply to Scribie, you can sign up directly at their website here. Want to earn more than just extra cash? I’ve been transcribing for Scribie for almost six months now. The first time I applied I got an audio that wasn’t very clear. Needless to say, I didn’t get in. The second time I got in on my second test around mid-January 2013. This is definitely a great company to start out with transcription. That is a great way to earn online. I have been transcribing for sometime now. its much like voxtab. As Alice pointed out, the pay for this company is ridiculously low. I’m sorry to be negative, but please don’t work for Scribie very long, ladies! You can do so much better than $10.00 per audio hour. The industry standard is $60.00 per audio hour (two speakers). A rate that low is an insult to you and to the transcription industry. It devalues who we are and what we do. That works out to lower than minimum wage– more like an offshore labor wage. There are nearly fifty companies that hire transcriptionists at home– even those without experience. Use Scribie to practice until you land a real transcription contract where you can actually make a living wage. Thanks for your comments Alasia. I think that — as you said — Scribie, Quicktate, etc. 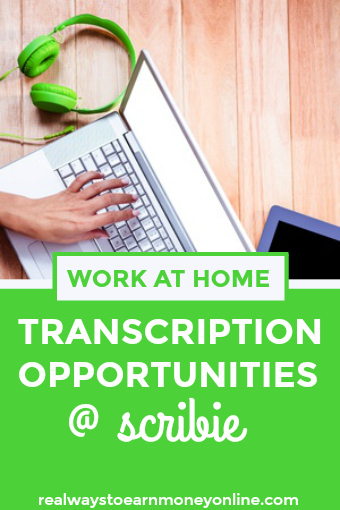 are OK places for getting your feet wet and figuring out whether or not transcription is a career to pursue, but there are definitely better paying opportunities out there once you get some experience and decide transcription is what you want to do. It is definitely possible to make good money with transcription. I think a person who has never done transcription at all might benefit from “practicing” as you put it at a place like this. What are the other sites for better transcription jobs? Here’s a list I made of several other transcription sites for people who are trying to break into the field. Scribie is on the list, but there are four or five others. I was approved to test for Scribie, but the test files had audio that was terrible. It sounded as if the people were outside on a busy street, and their voices were barely registering. Not only is the pay extremely low, but if the typical Scribie audio is like the test files, it is probably not worth the time to struggle through. I’ve done Claritrans files on Mturk. Yes, the pay is low, but at least the audio was clear. I’d say if you want to practice transcription, try Claritrans or perhaps Speech Ink on Mturk. Thank you for the advice. I’ve seen a few other people mention that the audio files are really hard to understand here. I just replied to another comment that pointed this out. $10 is absolutely SLAVE wages. AT BEST, if you are fast and have an incredible command of the English language, so you never even go near a word you’re not sure how to spell, think about it: you need to listen to the audio file at least twice: one to transcribe, and the other one to re-listen and make sure you didn’t miss anything or make any mistakes. So we’re already at $5 an hour, right there. But I can GUARANTEE you that there will be parts that are harder to hear, and parts where your mind just wanders for that one split second, or that person that speaks too fast or too muffled… And I GUARANTEE you that you will find at least one typo, or a misspelled word, at some point. And, there you go, now it is taking you 3x the audio time, and we have sunk down to about $3 per hour. Add to that the fat that you will have to pay self-employment taxes (about 6% higher than “regular” taxes), and PayPal fees (2%), and that you will have to waste time looking for these jobs, looking at the websites, checking your email, logging in, blabla. Well, you’re probably looking at making about $2 an hour. And that’s if you are SUPER-GOOD and FAST. I would expect the average-good typist (55WPM) to be making about $1 an hour. Thanks so much for your input, Glenda. I have for sure heard that transcription can be much harder than you think it will be at first. I have never bothered with it seriously as a way to earn money, but it is something I have considered. I’ve been hearing a lot about Scribie months ago and applied without knowing that it needs a verified Paypal so I have to delete my account after receiving that I didn’t passed. I will try to apply again, hopefully I’ll pass. Thank you for this information I am really in need of a part-time/homebased job. I’ll browse more on your site and see for more part time jobs. Hopefully you will get in the next time. There is a lot of info here — I hope you can find something you can do part-time from home. Please let me know if you need any additional information on anything. Thank you, Anna. Yeah I see a lot of information about homebased jobs and I even registered to some. Hope I’ll get a job soon. I’ll be happy to share it here if I’ll pass. Thank you very much! just an update. i received an email from scribie yesterday saying that I can now take the test, maybe I’ll try it this week because it says I have to finish it in 2 hr TAT hopefully I pass. Yay! That is wonderful news. Good luck to you on the test. I apply for this a couple of days ago. It first said I was 25 on the waiting list. Now it says that I am 38. Is there any other sites like this site?? Remember, that $1 for 6 min of transcription posted above……here is the rule for transcribing. One hour of dictation takes anywhere from 3 to 6 times longer to transcribe. So 6 minutes of dictation is going to take 18 min to 36 min to transcribe, depending on your expertise and speed. So, you are new or slower, and it takes you 36 min, you will be paid $1 for half an hour of work, or more pointedly, $2 per hour. Good point, Alice. I would say it would take a great deal of time for people new to transcription to build up speed. Anna, I think those are pretty average numbers, really. Professional transcribers get paid about $2 per audio minute, which makes it doable. Think about it: even if you are able to type 100+ WPM, and thus keep up pretty well with the rate of the audio, you will have to occasionally start and stop to listen again, just because you missed a word for whatever reason, or because you cannot keep up with the speed of the audio (which I guarantee happens a lot–which is why there are special machines for typing VERY fast, like court transcriptionists) You may also have to ID speakers, if what you are transcribing is a conversation. So let’s say, you’re super-fast, this part takes about 1.5x the time of the audio. Now you have to proofread. Which means you have to listen to the whole thing again, start to finish, and make any corrections or changes. You will have to stop rolling the tape to make said changes. Easily another 1.5x. So, there you have 3x. 3x is, I think, pretty much the minimum it could conceivably take to transcribe something. Having done it myself, it usually takes a lot more than that because you aren’t transcribing audio that is perfectly clear, you might run into slang/professional terminology you’re unfamiliar with, and so forth. I did one project where the audio was so bad it was taking me about an hour to do 5 minutes. Thanks for the information, I applied and my application was accepted the next day. But the downside is because I am a beginner I think I am being placed on the bottom of the list for testing. So I dont know what the wait time is for the test, but will let you know how it goes. I did sign up for instant cash sweepstakes, it was fun! I have been putting this off for a while! I might need to check it out and see what comes of it! Katie, I am the same way! I have a hard time understanding what people say, which I guess is one reason I’m not sure I could do this type of work well. Actually its a lot easier then you think especially when you use the software most require called express scribe. it allows you to slow the audio down and type within the same software and window. so you can slow the audio to the speed you need to so you won’t need to listen to it over and over. Also with Scribie, you are allowed to listen to the audio files first before accepting them so if some are not clear enough for you, just move to another file. Same here with the listening twice! Morgan, thanks so much for providing encouragement with your comment. I have heard about this website for many months now and finally applied last week. My application was accepted so on to the next step. I was somewhat hesitant about transcription but now looking foward to starting this wonderful trade. Thanks again! Ah, good to know about the software! I guess that would definitely simplify the process. Sergeantrom — congrats on getting your application accepted! Are you testing next? Please do come back and let us know how you like it after you start the job! Make sure your pay pal is verified before you begin. Or else you have to delete the application and reapply. It’s a pain.